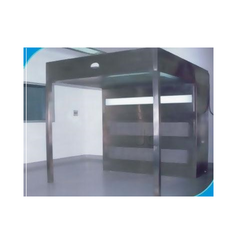 Leading Manufacturer of clean room panels, class 100 clean room, clean air system, clean room door, vertical clean rooms and clean room windows from Mumbai. 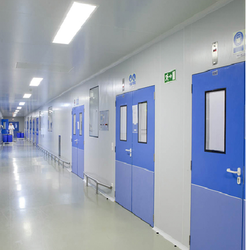 We are the leading and prominent Manufacturer, Exporter , Trader and Supplier of Clean Room Panels to our clients. Axenic Class 100 Clean Room or vertical reverse flow clean air work station. Axenic class 100 vertical containment clean air work station have S. 304 / m. S. Powder coated construction, comprising three stage filtration system. Initial filtering is accomplished with 10-micron prefilters and second stage filtration is done with 5-micron prefilters. Final stage of 0. 3 micron HEPA filter at the supply air point to ensure that aerosolized particles are picked from floor level, suitable curtains 6” wide on the front side, single skin S. S. Side panel on either of reverse flow unit to avoid influx from the surrounding with motor blower assembly, Magnehelic manometer, white light and an extra 5 amps 3 pin electrical socket with switch. Clean Air System– Stand mounted (s. s. 304 / m. s. powder coated construction). 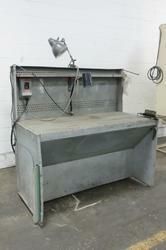 Axenic Class 100 Vertical Laminar Down flow Work Station in S.S.304/M.S. constructed with powder coating, has a high standard features which comprises of HEPA filters (Designed to filter particulate of dimensions down to 0.3 microns in size with 99.97% efficiency) pre filter (Designed to filter particulate of dimensions down to 5 microns with 96 % efficiency), Magnehelic manometer, motor blower assembly, acrylic panels on three sides and a 3 pin electric socket with switch of extra 5 Amps. HEPA Filters – EU grade with 99.97% efficiency on micro disperse 0.3-micron challenge. Custom designed, direct-drive form motors with impellers are dynamic and statically balanced electronically. Impellers are sized to offer sufficient airflow. They are known for low vibration and noise level. 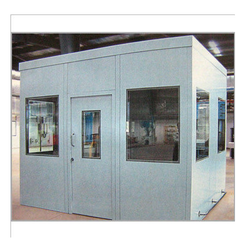 As one of the reputed manufacturers of industry, we are engaged in supplying high-quality Clean Room Doors. They offer proper air-tight sealing. Doors have a smooth surface structure, it can be easily cleaned. 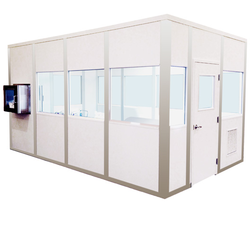 We offer simple design Vertical Clean Rooms that are known for its clean air environment in which air is conditioned for controlling humidity and temperature. It also controls the air pollutants, such as germs and dust particles and other harmful gas content at lower levels than the standard working atmosphere. 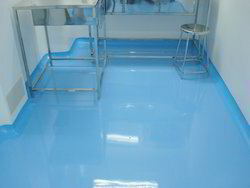 We offer two types of clean rooms, including horizontal flow and vertical flow. 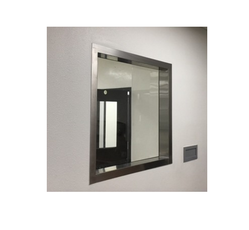 We offer a wide range of high quality Clean Room Windows which are specially designed to ensure safe and clean air in the work space. Aeulus products are well known for high efficiency in controlling and maintaining the perfect condition for high productivity. The glazed units are placed and stuck with adhesive tapes on either sides of the frame, so that it is glued to the surface of the wall. And the gaps are crammed with silicon sealant. Our standard window sizes are 4’x3’. We also offer product customization as per our clients’ required specifications. 1 The Axenic standard windows are 4’ x 3’ High although non standard sizes can be provided. 2 The glazing is finished with a 1” black border to the perimeter edges. 3 The glazed units are so placed and stuck with both side adhesive tape in the frames that they are flushed with the wall surface, the gaps are filled with silicone sealant. We have the expertise and reliable workforce to manufacture Modular Cleanrooms, which have superior quality and are easy to operate and maintain. They are developed from suitable materials and custom manufactured as per client's need. Additionally, our provided clean rooms are processed adhering to industry standards and quality norms. 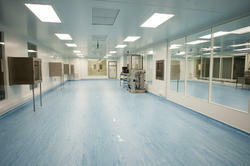 The offered clean rooms are examined on set quality parameter in order to deliver better range to the clients. Also, these clean rooms are made available in various colours, sizes and shapes. Looking for Clean Room Projects ?